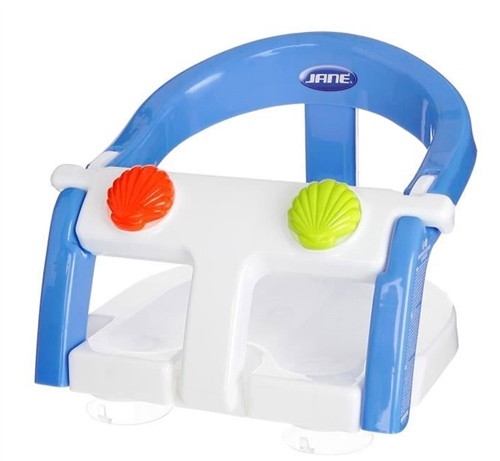 Includes toys on the front for the child to have fun in the bath. MATERIAL: polycarbonate plastic. EVA seat and backrest. Phthalate free. This bath chair is excellent! My 6 month old baby is very tall and nearer the size of a 1 year old. She doesn't fit into other 'top loading' seats. The hinged door allows easy positioning of baby and once closed baby is sure and safe. Very sturdy and nice to look at. Don't be put off by the price, although seems a little steep it is reflected in the quality of this item, after use could easliy be pass or sold on for further use. We had a inexpensive seat from a Department store and the plastic by our older daughters legs was quite rough. This seat has smooth edges and is bigger than most seats. We are so happy we got this one for our 5 month old! The way it opens to let baby in and out is great! Great to find a bath seat that opens to let baby out. Baby used not to like baths, but now she is in the 'big bath' and loving it. It does what it says on the tin - no complaints. Especially useful as our bath is quite deep. Many thanks.